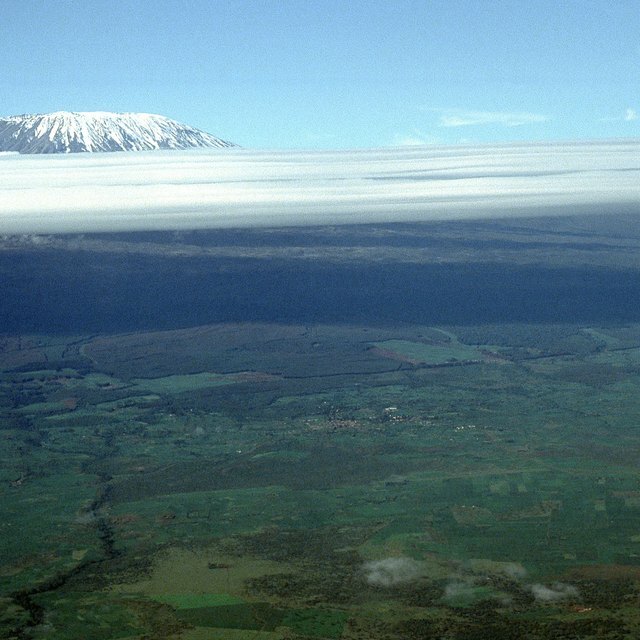 The Great Rift Valley Represents What Type of Geological Activity? What Are the Seven Continents & Where Are They Located on a Map? Continents are massive parcels of land, and generally they are separated by oceans, although not always. You can identify continents by shape or by position on the globe. 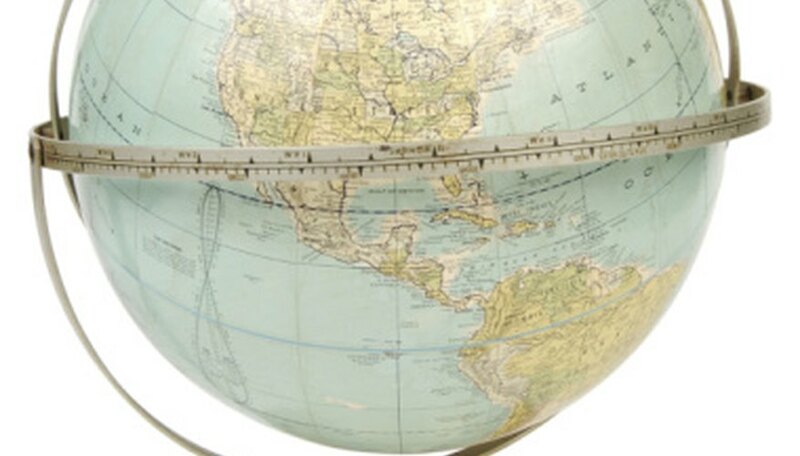 It is helpful to use a globe or map marked with latitude and longitude lines. Latitude lines run sideways, and the Earth's horizontal center line is called the equator. Above it is north, and below is south. Longitude lines run top to bottom, and the center line runs through England and Africa. To the left is west and to the right east. The Earth is divided into seven continents: Africa, Antarctica, Asia, Australia, Europe, North America and South America. 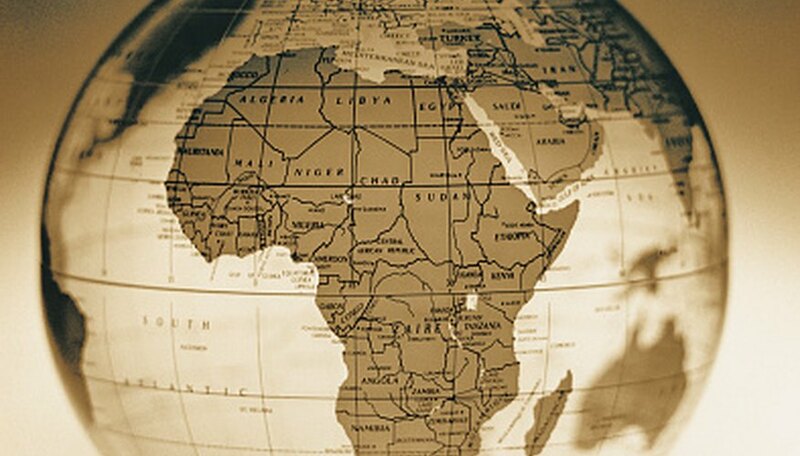 Africa is mostly in the Eastern Hemisphere and is almost entirely surrounded by water. To the north, the Mediterranean Sea separates Africa from Europe, and to the west is the Atlantic Ocean. On the eastern side of Africa, the Indian Ocean marks the boundary, although one large island, Madagascar, is considered part of Africa. The Red Sea forms part of the eastern border, too. Egypt occupies the far northeastern section, and its Sinai Peninsula is considered part of Asia. Antarctica is the land mass to the extreme south of the planet and covers the bottom of the globe. 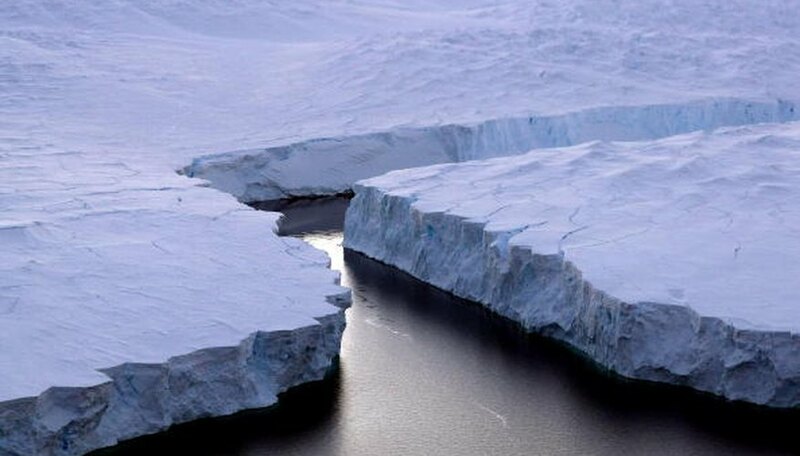 It is as much as 98 percent ice, so normally it is represented with the color white on a map. Antarctica is surrounded by oceans on all sides. The Atlantic, Pacific and Indian Oceans meet at Antarctica, and the sea immediately surrounding the continent is sometimes called the Southern Ocean all the way around it. It is so cold there that there are no countries, although scientific settlements exist from many nations. 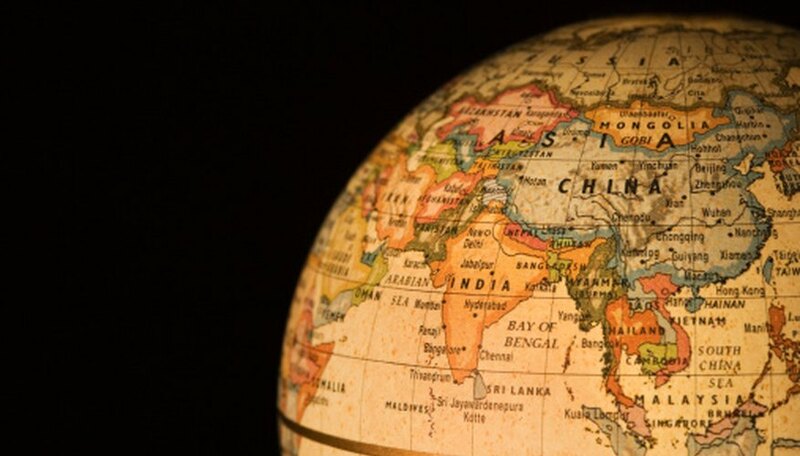 Asia is the largest continent and includes the Arabian Peninsula and Turkey to the southwest. It is defined by the Indian Ocean to the south, though the island of Sri Lanka is part of Asia too. Southeast Asia has thousands of islands, including Sumatra, Java and Indonesia. Along the far eastern coast, China is on the mainland and Japan sits between the Sea of Japan and the Pacific Ocean. To the north is the Arctic Ocean. The bulk of Asia contains the eastern part of Russia, which runs from the Pacific Ocean to the Ural Mountains and Ural River. 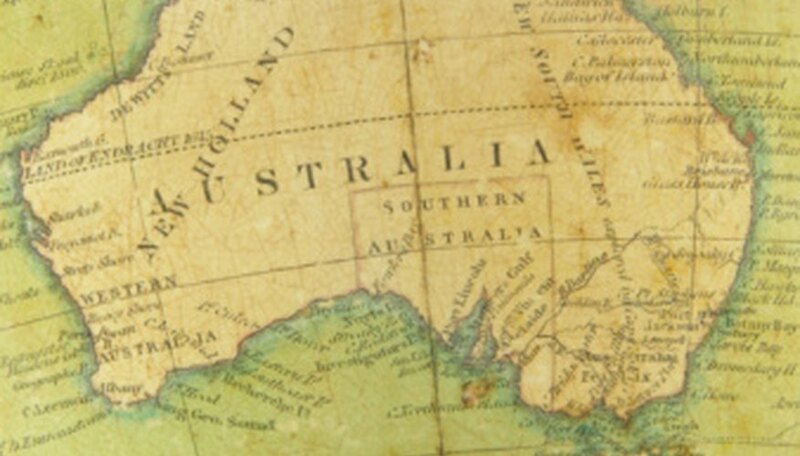 Australia is an island continent found southeast of Asia. It is generally considered to be the only continent that is also a country, and it includes the island of Tasmania. Sometimes the surrounding islands such as New Zealand and New Guinea are included as part of the same geological group. If you hear the term "Oceania," that is what they are talking about. To the north of Australia is the Timor Sea, the Gulf of Carpentaria and the Torres Strait. To the east is the Pacific Ocean, and to the west and south lies the Indian Ocean. Europe is another continent that can be difficult to define. To the south is the Mediterranean Sea, and the European country of Italy sticks out into it like a boot. To the west is Spain, which is separated from Africa by the Straits of Gibraltar. 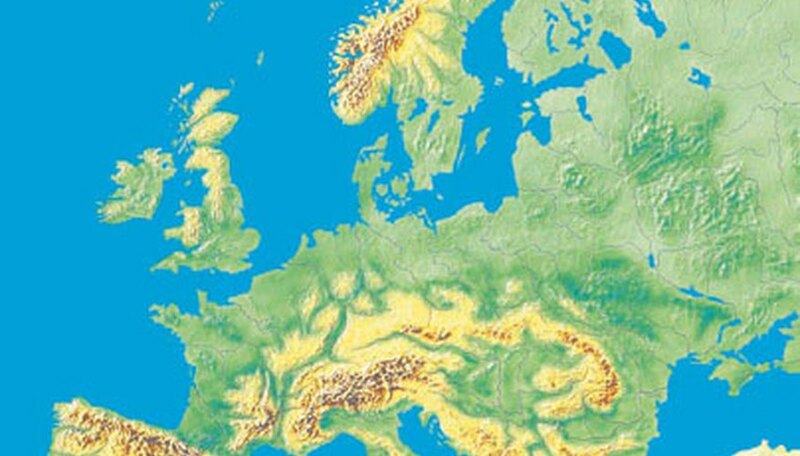 The Atlantic Ocean marks the western border of Europe until it meets the North Sea, where the Scandinavian countries of Norway, Sweden and Finland meet Eastern Russia. The Ural Mountains and Ural River separate Europe from Asia here. Many large islands are part of Europe, including England, Ireland, Iceland, Sicily, Sardinia and Crete. North America is home to Canada, the United States, Mexico and a region of smaller countries south of Mexico called Central America. On the east is the Atlantic Ocean, to the west is the Pacific Ocean, and to the north is the Arctic Ocean. Greenland, a large island in the north, is considered part of North America, as are the islands of the Caribbean Sea, including Cuba, Haiti and the Dominican Republic. The southernmost country is Panama, which features the man-made Panama Canal, allowing sea traffic from the Atlantic to the Pacific. Panama forms the bridge to South America. South America has a distinct shape with a large land mass in the top dominated by Brazil and tapering down to a thin arm of land containing Argentina and Chile. On the west is the Pacific Ocean, and on the east is the Atlantic. Just below the continent is the Southern Ocean and Antarctica. The island groups known as the Falklands and the Galapagos are part of South America. The continent has the largest river in the world by volume, the famous Amazon. It also includes the Andes Mountains, which run along the southwestern side of the continent. 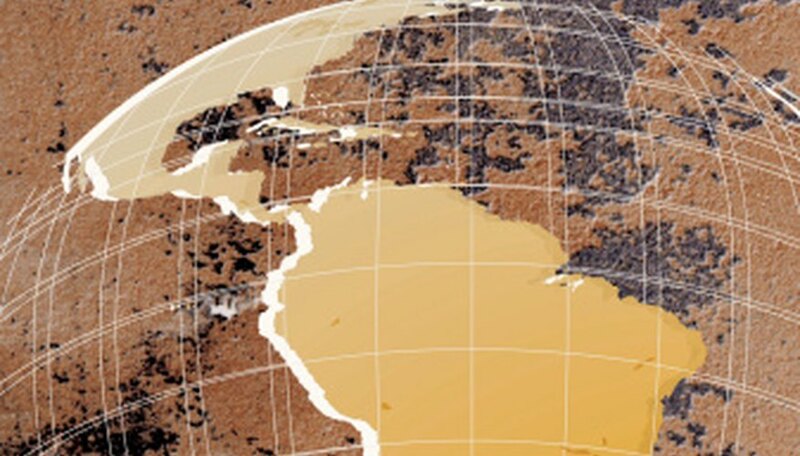 Universe Today: What Is a Continent? Sean Kotz has been writing professionally since 1988 and is a regular columnist for the Roanoke Times. He has also written for the Blue Ridge Business Journal, The Roanoker, 50 Plus, and Prehistoric Times, among others. He holds a Master of Arts in literature from Virginia Tech. 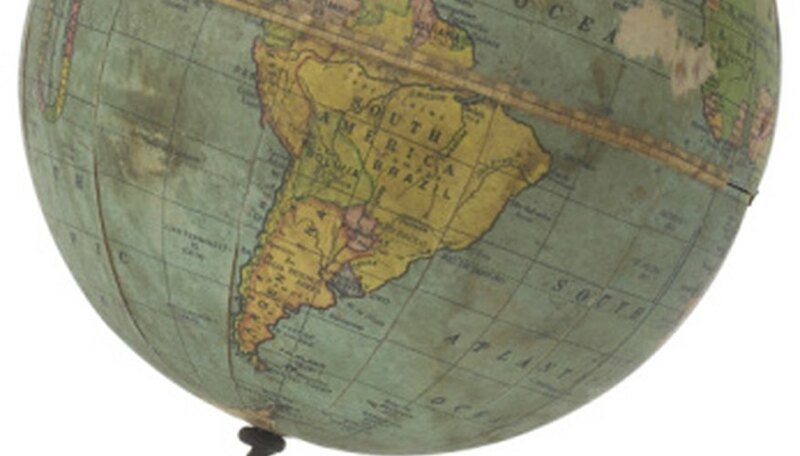 Which Two Continents Are Located Entirely in the Southern Hemisphere? Kotz, Sean. "What Are the Seven Continents & Where Are They Located on a Map?" Sciencing, https://sciencing.com/seven-continents-located-map-8554609.html. 25 April 2017. What Bodies of Water Are Found in the Tundra?